Is it still circus? Spectators looking for white-faced clowns, sequins and performing elephants will be disappointed. For this is a new kind of circus, in which the performers are "circus artists". Yes, there’s a big top, but the stage faces outwards and the performers are on a normal stage, not in a ring. There’s no ring, spit and sawdust. There’s no horse manure, growling wild animals. No circus riders galloping round or trapeze artists flying overhead. A few traditional simple acts, extremely well executed without trying to be showy or reinvent the genre, punctuate the show: the German wheel, floor gymnastics, the trampoline, aerial straps, hand-to-hand balancing, juggling. The latter, performed by juggler Tibo Tout Court, otherwise known as ’Oui-Oui’, with devilish dexterity, proves to be the most moving part of the evening. For in ’L’Atelier du peintre’, you have to look elsewhere for excitement, in those moments of magic that arise from the merging of theatre, dance, music and performances by contemporary artistes. 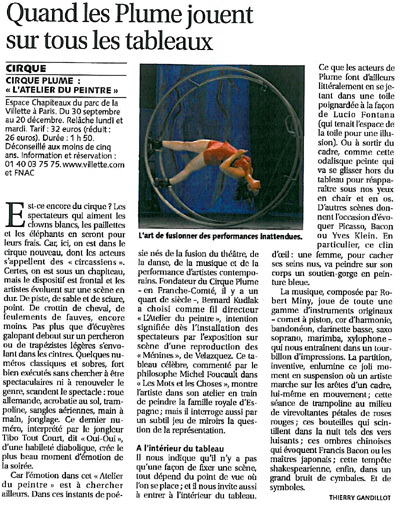 Bernard Kudlak, the man who founded Cirque Plume in Franche-Comté a quarter of a century ago, has chosen the theme of ’L’Atelier du peintre’ (the Artist’s studio), his intention becoming clear by seating the audience in front of a stage set with a reproduction of ’Las Meninas’ by Velazquez. This famous painting, mentioned by philosopher Michel Foucault in ’Les Mots et les Choses’ (The Order of Things), shows the artist in his studio painting the Spanish Royal family; but he is also addressing the matter of representation in his subtle use of mirrors. He is telling us that there is more than one way of setting a scene; everything depends on where you are standing; and he invites us to enter the picture. This is exactly what the Plume performers do by throwing themselves into a canvas that has been stabbed in the style of Lucio Fontana (who took the canvas to be an illusion). Or stepping out of the frame, like the painted odalisque who glides out of the painting to reappear in front of our eyes as flesh and blood. Other scenes bring to mind Picasso, Bacon or Yves Klein. One sketch in particular: to conceal her naked breasts, a woman paints a bra on to her skin in blue paint. The music, composed by Robert Miny, uses a whole range of unusual instruments - a cornet, a French horn, bandoneon, bass clarinet, soprano saxophone, marimba, xylophone - that drag us into a whirlwind of sounds. The inventive score colours the moment in the show when a performer walks over the edges of a frame, itself moving; or when a girl trampolines in the middle of spinning red rose petals; bottles that shimmer in the night like glow worms; Chinese shadows that are reminiscent of Francis Bacon or the Japanese school of art; rather like in Shakespeare’s tempest in fact, with a great clash of cymbals. And symbols.